Have you visited Kindrunner yet? It's a new online store, offering a unique shoe/gear shopping experience. 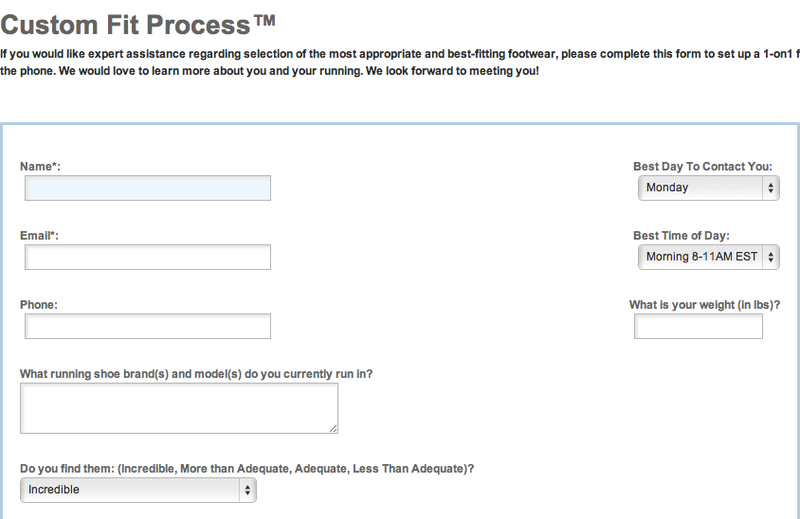 One of the aspects that makes Kindrunner unique is the Custom Fit process. If you live near a local running store, then you already know the kind of attention and care you receive in shopping for shoes. But if you don't, Kindrunner is a great option. As a Kindrunner Ambassador, I wanted to really experience what the Custom Fit was like and see what kind of advice I would be given. Aside from the lack of being able to try on numerous shoes in one visit, which is only possible if you just order a ton of shoes and then return them, which really just doesn't make sense to me. But for me, since I do have a shoe obsession, if I want to try on some shoes, all I need to really do is walk up to my closet and try them on. Back to the process. I clicked on the Custom Fit link along the top and I was brought to this page. I apologize for the page not being completely lined up. I tried! But you get the idea. In my opinion, the questions were quite detailed and there weren't too many. I especially liked that the process asks that you upload a picture of the wear of your shoes. I really could have gone overboard and take pictures of every single pair of shoes I've worn in the past month, but I chose to keep it simpler and choose the shoes I've worn the most for the past month - which meant I chose my Evo Wave Cursoris. 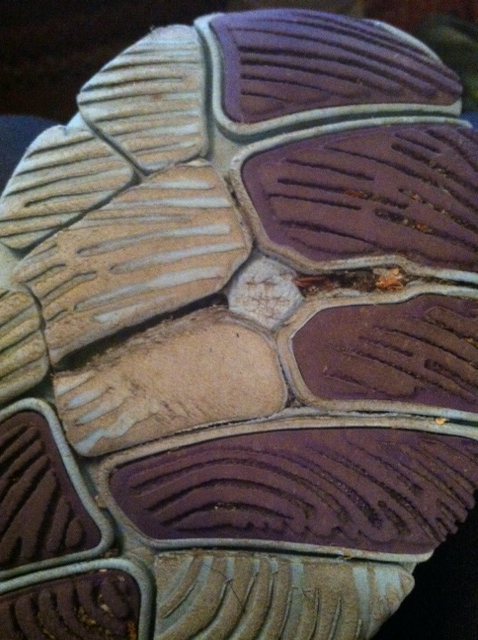 Holy worn in the midfoot. But Joe saw something more. And I was impressed! - Since my May marathon, my left ITB has been bothering me. My left calf has been tight and my new "ache" is the arch of my left foot. Joe saw that I am a midfoot striker, and moving slightly lateral on the left foot and probably why I'm experiencing the issues with my ITB. He also said based on my foot strike, I should stay with neutral cushioned shoes (right on, Joe!). He also noted that my calf/arch issues may be due to the zero drop shoes I've been wearing. I definitely agree. I have been wearing a lot of zero drop lately. He suggested I combine 4mm and 0mm drop shoes to alleviate my issues. My thoughts - YES! I'll do whatever I need to do to get rid of the pain. I WILL complete that Ultra! Joe also mentioned the Feetures Plantar Fascia sleeve and CEP compression socks. Hmmm....while I've definitely heard of both of those companies, I have yet to try either one. I do have a variety of other compression socks, sleeves - but haven't ventured to Feetures or CEP. I will definitely check them out as well! I'm curious how they compare to Zensah, Tommie Copper, SLS3, and ProCompression (all the other compression socks/sleeves that I currently own). And I've never heard of a sleeve made for Plantar Fascia. Pretty cool! Joe added in that he himself uses the sleeve and swears by it. I love that he has actually used the product. I can really take advice from a person who has actually used the item before! Joe's shoe recommendations were awesome as well and he listened to my wide foot issues and directed me to men's shoes. My biggest complaint is the most shoe companies do not make women's wides in lower profile shoes. Listen up shoe companies - make wides and I'll buy your shoe! I am also betting that there are tons of other women out there who are in the same boat. Okay - off my soapbox and back to my shoe recommendations. 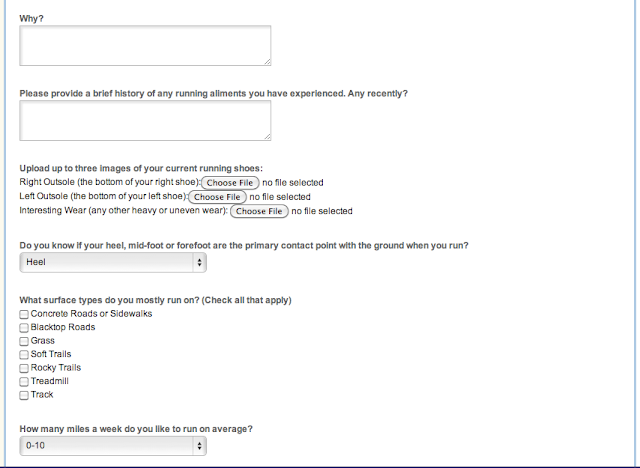 As you can tell - I already have 2 of the recommended shoes....so I may have to venture out and try out the Brooks! Saucony Virrata - Yippee! I already own them, and pulled them out again. They were my Sugarloaf Marathon shoe. Brooks Pure Drift - Hmm...haven't tried that one yet. I tried the Pure Connect and didn't like it because it was too narrow. Maybe I need to try out the Drift! Ward loves his Pure shoes. 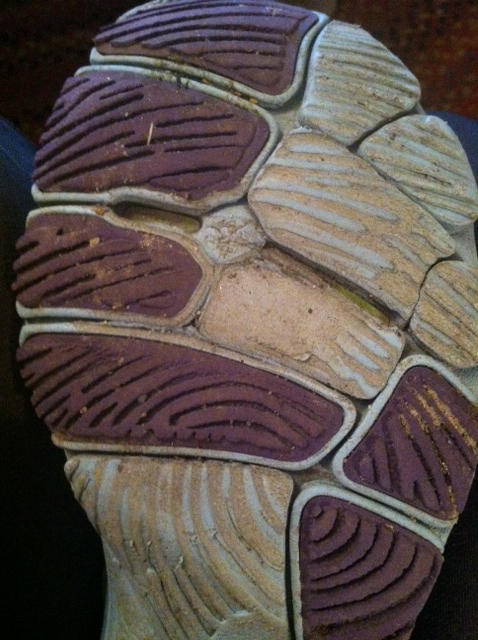 Joe also mentioned that these shoes come with an insole I can add that will make them a 2mm shoe. Now that's pretty enticing! I also really liked how he mentioned the wider forefoot on these. I definitely need shoes with a wide forefoot. Saucony Kinvara - Again, yippee! I have the 3's and the 4's and I pulled them out again. I'll be running in them quite a bit until my calf/arch issues are resolved! Brooks Pure Flow - I did try out the women's Pure Flow when they were first release last year. I know they aren't wide enough for me, but I haven't tried men's. I'm quite interested. Another aspect on how Kindrunner is like your local running store? If you don't see a specific model, size or color on their website, just contact Joe or Pat with your request to see if they can special order what you are looking for! That's definitely an added bonus! 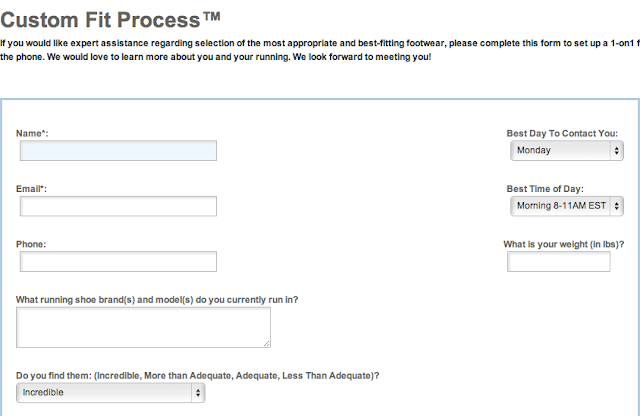 If you are looking for shoe advice, a new shoe - Kindrunner's Custom Fit is definitely a place to start! Joe and Pat are ready to take your information and come up with solid recommendations for you. Disclaimer: I am a Kindrunner Ambassador. I was not required to go through the Custom Fit process and was not compensated for this. All opinions expressed on my blog are always 100% my own. Sounds like a very complete fitting, and they do so much to give back.. win! This is why I love KindRunner!! They go into depth and are so helpful! So awesome! Just another reason why I'm proud to be an ambassador! Patrick ordered me a pair of wave enigmas yesterday and I can't wait! wow I love how helpful they are and how much he was able to tell from the soles of your shoes, now I want to try it! AWESOME! Very cool! I usually go to my local running store but I'm interested in doing a comparison since I've been having major foot issues lately. 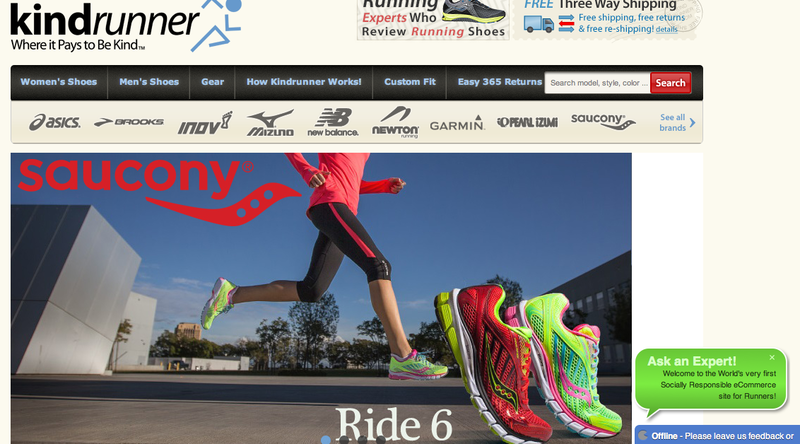 Love that kindrunner.com is more than just a "shoe store!" This is great to know about, how cool that they figured out how to do a custom fit online :) And I love my Kinvaras!!! Very cool! I've heard so much about them!